The average caregiver is age 46, female, married and working outside the home earning an annual income of $35,000. – Arno, P. S., Arno, P. S.(2002, February) . The economic value of informal caregiving, U.S.
Caregiving touches every segment of the population. Men and women are equally likely to be caregivers. People of all age groups provide care for loved ones, with a slightly higher percentage of those ages 30-64 saying they do so. Caregivers are more likely than other adults to be married and to be employed full time. 36% of U.S. adults said they provided unpaid care to an adult relative or friend in the past year, up from 27% in 2010. Eight percent said they provided unpaid care to a child living with health challenges or disabilities, up from 5% in 2010. 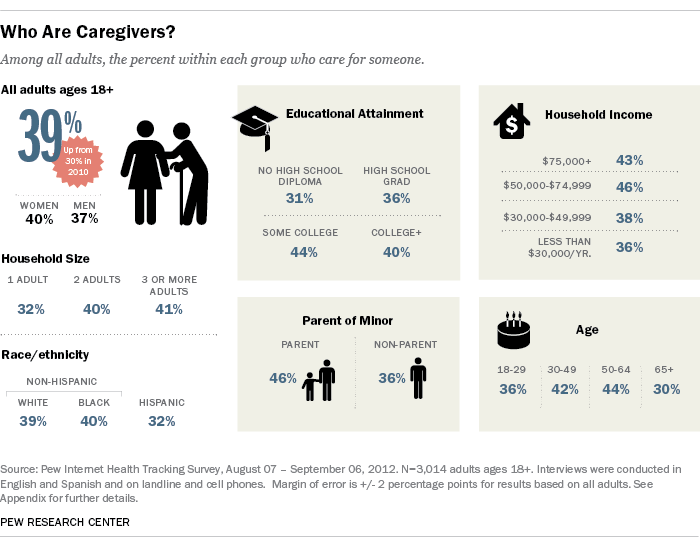 All told, 39% of U.S. adults are caregivers, up from 30% in 2010. They are also more likely than non-caregivers to have gone through a recent health crisis or to have experienced a significant change in their physical health (including positive changes, such as quitting smoking). This finding dovetails with clinical studies showing that the stress associated with caregiving has an independent, negative effect on people’s health. Thirty-nine percent of caregivers say yes, they manage medications. Women are more likely than men to say they manage a loved one’s medications: 47% of female caregivers do so, compared with 38% of male caregivers. Caregivers age 30 and older are more likely than those between the ages of 18 to 29 to say they manage medications. There are no significant differences among education, income, or ethnic groups. Of those who manage medications, 18% say they use online or mobile tools, such as websites or apps, to do so, which translates to 7% of all caregivers. College graduates are the most likely group to use technology to track medications. Otherwise, there are no significant differences among caregivers along age, income, or ethnic lines. An aging population and a rise in the percentage of people living with chronic conditions means that the United States will need to increasingly rely on family caregivers to provide front-line health care. This study presents evidence about how caregivers currently gather, share, and create health information and support.